Children in his area used to simply loaf about and needed something to focus on. Chennai: Enter the Mahatma Gandhi Library (Nool Nilayam) in Saidapet and the first thing you will see is a painted bust of the Father of the Nation. 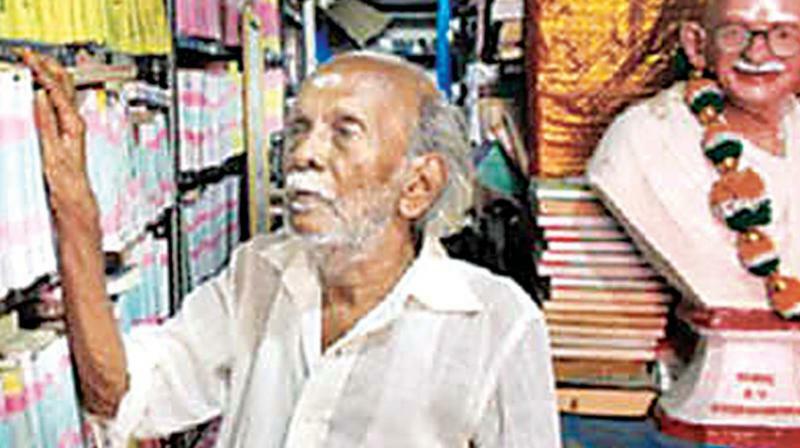 “He is the reason I have been running this library since I was 22 years old,” says K Mahalingam, now an 88-year-old man. Born into a family of tailors, Mahalingam studied up to class five before dropping out. “The books there simply weren’t interesting enough for me,” the librarian says. Then he met Mahatma Gandhi. “He came to the Hindi Prachar Sabha here in 1946.” Hearing him speak inspired Mahalingam to give something back to society, and he thought he could change one thing. Children in his area used to simply loaf about and needed something to focus on. “So, I decided to lend out books so people did not have to burn holes in their pocket to borrow from,” he says. And thus began Mahatma Gandhi Nool Nilayam. When it first started out, it was not a library per se and he used to lend books out of a humble trunk (petti) near a friend’s tea shop. Soon, the word spread and he found a helpful friend in M K Venugopalachari, a resident of Saidapet who rented a small room for the library on Karaneeswarar Koil street, where it still stands to this day decades later. For the readers’ convenience, Mahalingam has bound the books in a special manner. “Women authors have pink covers, and everyone else has either blue or yellow covers,” he says. The walls are damp, roofs leaky, but the man’s passion for his job has stood the test of time, and the law. “There were three land rights cases I had to fight to have the library. Finally, the judge said that it can run till I’m alive. That’s enough for me,” he says. The iconic Gandhi statue which stands in the middle of the library was inaugurated by then Chief Minister Kamaraj in 1958. “I do pooja for it every single day,” he says. “Since then, I approached Kamarajar directly several times, especially for donations. The politicians then weren’t like those now. They used to be very approachable,” he says. The price of the membership started at just 50 paise and is now Rs 60. Mahalingam’s library members too, have changed. “Earlier, lots of students used to visit us. Now, it’s mostly women, especially housewives who want to take their mind off of the routine but do not want to watch television. It really is an idiot-box,” he chuckles. Every year, Mahalingam organises an event where he felicitates Tamil authors, whose work he admires. “The money for all the proceedings is collected through donations. People who have used this library and benefitted from it, always remember to return the favour, and send us huge sums of money,” he says. The octogenarian and his library have been instrumental in creating a number of IAS officers, doctors and collectors over the years. The library and Mahalingam have won several awards, notably Dr S.R. Ranganathan award “I was also invited to the Tamil Nadu book fair this year as a special invitee,” Mahalingam beams with pride, as he shows the invite. reason this place still stands,” he says. His neighbours too, help whenever needed. Mahalingam also credits former Mayor Saidai Doraiswamy for being a huge pillar of strength. “He never says no to me. I still go to his house and demand things with a sense of entitlement,” Mahalingam says.